Femme au foyer: A Baltic Christmas Day 5 - Piparkūkas! Day Five of 24 Days of a Baltic Christmas is written by my mother, Inga Lucāne, who has been threatening to start writing a blog. Inga is first generation USA-born, and is interested in making sure that Latvian traditions, including baking, are not lost to those living outside Latvia. Piparkūkas – literal translation pepper cakes – a perfect activity for the weekend! If Christmas had a scent, it might be piparkūkas! The aroma is heady, intoxicating, piquant and sweet: immediately transporting you to some moment or place in that deepest of memory centers – scent. My husband Gunārs claims that he can smell piparkūkas baking in our home from the end of the block! The color, a beautiful golden-brown anywhere on the spectrum from pale gingerbread to barely creamed coffee. The names of the spices roll off the tongue and somehow evoke both distant, hot, exotic cultures, at the same time offering the comfort of a warm home hearth on a snowy day: coriander... cardamom... ginger... nutmeg... cloves... and the more pedestrian but no less necessary cinnamon and black pepper! A bite of piparkūka in your mouth is truly a mélange of morsels from all the corners of the Earth! Our long-ago ancestors may or may not have used the same intricate balance of flavors. The first gingerbread-type recipes came from Greece in 2400 BC; Chinese developed recipes during the 10th century. Many believed that the peppery-sweet baked goods had special powers to repel demons, please the gods, and nourish the dead in afterlife. It is thought that gingerbread was brought to Europe in 992 by an Armenian monk, and by the late Middle Ages, Europeans had their own version – hard cookies, sometimes gilded with gold leaf, shaped like animals, kings and queens, were found at fairs in England, France, Holland, and Germany. German immigrants brought gingerbread to Sweden in the 13th century; abbey records show that Swedish nuns used them to ease indigestion in 1444. In 15th-century Germany, a gingerbread guild controlled production. The closest relatives to the Latvian piparkūka are Norwegian pepperkaker, Swedish pepparkakor, Danish brunkager, Icelandic piparkökur, Finnish piparkakut, Estonian piparkoogid and Lithuanian aromatingosios snaigės. Although spices did come north in trade for amber, flax, wool, wood, dairy and meat products, I can very well imagine our great-great-great...grandmothers having their own secret herbs, seeds, and aromatics in their klētis (storage buildings, barns or granaries) or attics. Latvian bakers are very possessive of their recipes, often handed down in the family – a sort of tribal loyalty – and are very particular, competitive, and quick to comment on another's. We sometimes hotly debate about which attributes make the "best" piparkūkas. Discussions are renewed every year about the use of molasses versus corn syrup; the ratio of honey to molasses; how long to rest the dough; butter or lard?, or both! Is thinner better? To brush with egg or not to brush before baking... shiny from egg wash or matte left bare? Is a one- or two-bite piparkūka more refined? Should decorations be "natural" – almonds, pearl sugar – or are colored sugars and sprinkles allowed? Piparkūkas vary from home to home – just as many American home cooks have their own apple pie recipes, each Latvian saimniece or mājasmāte (femme au foyer) has her own piparkūku recipe, often loyal to a family recipe that has evolved over years. No matter that the recipes may be almost identical, some nuance in flavor, texture, crispness, thickness, or choice of decoration sets them apart, as does degree of doneness and variation in shade of golden-brown. My mother's and my godmother Dace's piparkūkas both have a very distinct honey note, and more often than not, are left unadorned. My sister Antra's are dainty and aromatic. My sister-in-law Zinta's piparkūkas are tiny, fragile bites of flavor that crunch and then melt in your mouth. I prefer mine to have a bit of "bite", just enough zing to wake up your taste buds and "have to have another one, just one more!" My earliest memories of piparkūkas involve long, impatient waiting, while an "adult with strong arms" has rolled out a whole tabletop's worth of dough perfectly evenly and deemed it "thin enough", then trying to press my favorite cookie cutter shapes (stars) as closely as possible to avoid a repeat of the long roll-out wait again! Our daughter Anna associates piparkūkas with me standing by the stove, smelling spicy, for a long time using my BIG spoon to stir, stir, stir the dough. The scent truly does get into every pore of your skin, every hair on your head, and the sheets on your bed – they will all smell of piparkūkas for days! My nephew Edgars, backed up by brother Andis, complains that "the women and the girls" never let them do the rolling. My mammīte, my sister Daina – their mammīte, and their sister Annelī all nod in agreement: of course the women and the girls get to do the rolling! There truly are dozens of recipes written for piparkūkas, with both small and immense variations – some call for addition of other spices and flavorings, such as anise, mace, allspice, lemon or orange zest, vanilla, grain alcohol, brewers' malt, rum, cognac, rosewater; others incorporate almond meal, sour cream, farmers' cheese, raisins or carrots. A Latvian cookbook published in Sweden in 1956 suggests adding burnt sugar, strong coffee, or dark cocoa to enhance color. Decorations and garnishes can run the gamut from bare, a single almond slice to tinted powdered-sugar glazes used as watercolors, rum punch or chocolate dip. Older recipes call for briežragu sāls, which literally translates to "staghorn salt" – I think that it may be ammonia carbonate; it was used in place of baking soda and/or powder. The queen of piparkūkas, of course, is the piparkūku sirds (piparkūku heart); so much so, that in 2011, Latvia issued a 1 lats coin with a piparkūku sirds. Many people I know cannot resist nibbling on the raw dough, and often complain that they struggle to get even half of the dough rolled out and baked into cookies. When their helpers – children (of all ages), husbands, friends – pick off the "in-betweens", the dough between the cookie shapes, more ends up in stomachs rather than recycled/re-rolled. Fortunately, I have not experienced the dire consequences some grandmothers warned of – that the raw dough will lump and harden in your stomach! Because who can resist: tasting, and then "tasting" again, and again? My younger sister Daina remembers the excitement in tasting the first piparkūka of the season, but even more, the piparkūku dough resting in its Dutch oven on the windowsill of the pantry in our childhood home – a cool, safe place – and sneaking a pinch whenever we could get away with it. 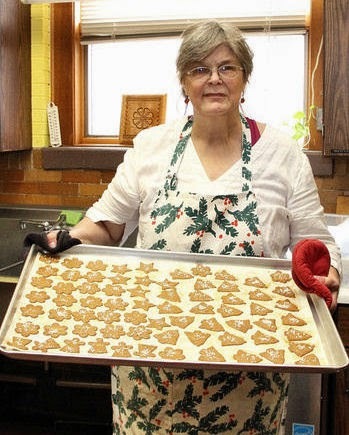 Each year, all throughout November, the halls of our Latvian Saturday school welcome us with piparkūku aroma, because the Ladies' Auxiliary of the Latvian church we share space with has been meeting weekly for piparkūku talkas (baking bees) – a whole day of rolling, pressing, baking, weighing. Each Latvian church – there are two in Chicago – produce 300+ pounds yearly, for sale at the Christmas bazaars, for gifting during visits to elderly and shut-ins, for eating at the Ziemassvētku sarīkojumi (the Christmas celebrations). In comparison, our Latvian school students and parent volunteers bake only about 60 pounds during two consecutive Saturdays in December. This is an activity students anticipate well in advance, and almost no one is absent on those Saturdays. Every baker gets a baggie of piparkūkas to take home, some are weighed and sold at the school's Christmas bazaar, others set out to treat our guests. The baking talkas are highly social events, with lots of camaraderie, visiting and gossiping; and an extremely satisfying end result! And it's not just the ladies, or mothers and grandmothers working; piparkūku talkas are non-discriminatory volunteer opportunities, and some of the men and fathers have developed their own "specialties", such as rolling, transporting table to oven, or weighing into containers for sale or gifting. Though purists insist that hand-rolling is the only true way to form piparkūkas, we are always tinkering to upgrade the "cookie production line". We've gone from hand-rolling with a rolling pin to a hand-crank pasta mill, now upgraded to a pasta attachment for my Kitchen-Aid mixer. Ēriks, our school's current expert "roller", has developed a system for perfect dough roll-outs, with parchment on a balsa wood plank, the dough a bit pre-formed into a flattened brick, the Kitchen-Aid attachment set at thickness 4 and the mixer running at speed 3. 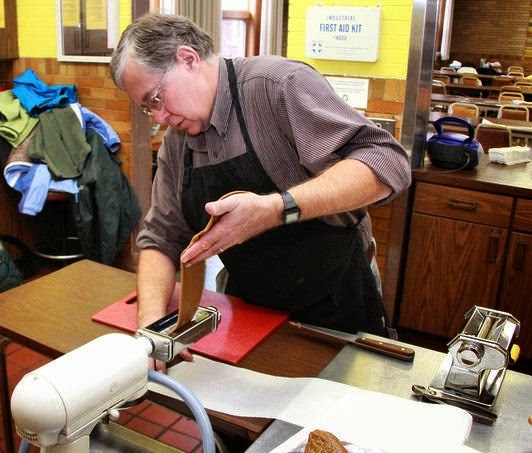 The strips of dough are delivered to the "pressers", who choose the cookie cutter shapes, press and cut the dough, and transfer the raw cookies to parchment covered cookie sheets. These are then passed on to "painters" and "decorators" for painting with egg wash for shininess and the excitement of choosing the right garnishes for each piparkūka! Chopped nut eyes for animals and birds and buttons for men; yellow sugar for stars, red for hearts, white for angels; green sugar and nuts and sprinkles for trees! Occasionally the sugar eclipses the cookie. The more alike in thickness all the piparkūkas on a sheet are, the more likely they will bake evenly. Probably the most stressful job at a piparkūku talka is the oven-tender's; the cookies are usually ready sooner than you think. You must keep a very close eye on them, and remove them from the oven at exactly the right moment – precisely the moment the edges are starting to darken. Too soon, and they're not crisp, too late, and they're burned. There are those who will insist that they actually prefer the blackened piparkūkas, that they are "good for digestion". Hmm. I like them a perfect, crispy golden-brown! Many aromas evoke Christmas emotions and memories, but for many Latvians possibly the most powerful is the scent of piparkūkas. You step through the door from a cold night into a home lit by a Christmas tree and candles, breathe in the lovely scents from a warm kitchen, and feel that certain shimmer in the air. The saimniece invites you in, offers a bowl of piparkūkas – they could be large or small, ornately decorated or completely bare, pretty or not – you know that they have been baked with care and love. You take one, and take a bite, and your heart warms embraced by the scent of piparkūkas, you can't help but smile – everything is alright with the world. Two piparkūku recipes follow - similar, yet different. The first, mine, relies on somewhat precise measurement, because I make a lot of this dough every winter, and batch to batch needs to be consistent. My sister-in-law Zinta's recipe is more "old-fashioned Latvian" style - to taste and by feel. The author Inga, with a pan of piparkūkas! Piparkūku recipe triples well – just be sure your pot is large enough! Yield: 2½ – 3 pounds dough, which bakes into the same amount of cookies! Please do not be intimidated by the length of this recipe – it's not really very complicated! This recipe is based on one from Dzidra Zeberiņa's Cepumi – kā vēl nekad (Baking – As Never Before), published in the USA, 1965; my mother's, grandmothers' and others' advice, and a bit of experimentation. If you like your piparkūkas less spicy, switch the honey/molasses ratio, and add just a bit less of all the spices. Using a wooden spoon, mix well until ingredients are dissolved and almost at a boil. Add: 2½ cups sifted flour, all at once. Using a wooden spoon, beat dough, turning the pot, lifting the dough from the bottom, outside to center, until well mixed and smooth. It should still be very warm. Using a wooden spoon, beat until eggs are incorporated. Using a wooden spoon, beat dough, turning the pot, lifting the dough from the bottom, outside to center. If dough becomes too stiff to use spoon, turn it out onto a floured surface and knead by hand until smooth, shiny, and not sticky. If dough continues to feel sticky, let it “rest” for a few minutes, knead again. I have found that it is easiest to add all the flour while the dough is still quite warm. When you have added the correct amount of flour (by measure), the dough may still seem a bit sticky, but as it cools it will become smoother and will not stick. When cooled, turn out onto a smooth, clean surface and knead until smooth and shiny. Do not over-knead, as this will cause the cookies to bake up tough, not crispy. Place dough into a container and seal tightly. At this point, you may also split dough into several smaller portions and store it in tightly closed containers or bags. Store in a cool place. Let dough “rest” at least a day or two, several weeks is ok. Tightly wrapped dough will store a month or more in a cool place. Roll out the dough as thin as you can, cut shapes using cookie cutters. Place cookie shapes on greased or parchment-covered cookie sheet, brush with lightly beaten egg, decorate with chopped or sliced nuts, colored or pearl sugars. Bake in a hot, 400°F - 425°F oven until golden brown (not very long, 4–5 minutes). Watch closely, because when done, piparkūkas burn very easily! Piparkūkas can be stored in a tightly closed container for several weeks. If left out in the air, they will soften. Zinta writes: This recipe is an evolution of M. Krones-Baldumas recipe in Ikdienas un svētku galds (The Everyday and Celebration Table), published in Sweden, 1956. Every year, I do something a bit differently. If my spices are not super-fresh, I add more. As for the flour, I never know exactly how much I add in the end, because I worry that the dough will be too hard, and too difficult to roll. I basically use butter, not lard – that makes the cookies firm and crisp. If you would like more fragile cookies, use part lard in place of the butter. Some bakers add baking powder; I usually don't. Note: Conversions from grams to cups are Inga's – ingredient conversion charts can be found online. Heat butter, honey, syrup or molasses, and sugar in a large soup pot or Dutch oven just to boiling. Remove from heat. Add half of the flour and beat well until cooled. Combine spices separately, add a cup or two of flour to mixed spices. Add eggs to pot, incorporate well. Add spice mixture when dough is quite cool. Add remaining flour gradually. Knead until dough is smooth and shiny. Let dough rest overnight or for several days, to let the flour swell. The dough will be stiffer. Preheat oven to 400°F. Dough will roll out more easily if at room temperature. You may warm it on top of the oven while oven is heating. Butter cookie sheet. Roll out dough very thin directly on the cookie sheet. Use cookie cutter shapes to cut dough, removing dough in between shapes. Bake 5 – 8 minutes, depending on thickness of piparkūkas. Thank you mammīte and Zinta! You’ve also reminded me that I need to get to it and prepare my dough... Photographs courtesy of G. Lucāns. 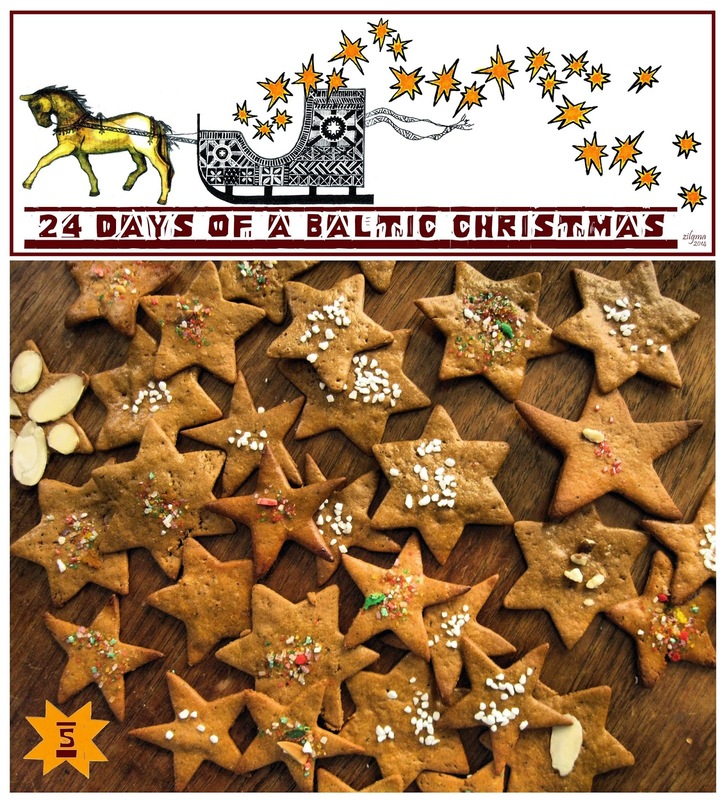 Stay tuned tomorrow for a Baltic gift guide! Mmmm who can resist Piparkukas! Great post Inga and perhaps you should start a blog! Haha that made me laugh Liene! Ohh, this made my mouth water!! Wonderful post, perfect photos, cool that two different recipes are offered. I am 1st USA generation born too! I got my spicy cookies from the Mpls Latvian church yesterday and a kind friend saved some dough for me. My 16 yr old daughters and I will roll, roll, roll our dough today. We will cut and sprinkle. My family did alittle sprinkle of powdered sugar fresh out of the oven. This smell IS my Vetsmommy's. I will remember with a SIGH in my heart. A gift beyond gifts that you cannot buy. Thank you for this post!!! I hope you have fun baking with your daughters! I bet the powdered sugar is great - it gets melty and sort of glazes the piparkūka? mmm, have to try that this year. Oh, and just this past weekend, I found out that piparkūku mīkla frozen from last December makes piparkūkas almost just as good as the current dough - my friend Jane, wife of the expert roller for our school talka, Ēriks, sent a small box with him Saturday, and they look fine, taste fine.... who knew? The things we can find in our freezers! I imagine it might be harder to work with, more fragile during rolling? I think if it weren't for the Latvian tirdziņi selling the dough in most of the Latvian centers in December there would be far fewer people baking piparkūkas... But it is possibly because they are so hard to buy ready-made that so many people still bake their own - even with year-old dough! Ēriks "the roller" writing: Great post! FWIW, last year's dough was tucked away in the freezer and forgotten about.... but rolled out beautifully on our hand-crank pasta roller once warmed to room temp and kneaded a bit to soften the structure. The pre-rolling is necessary (after a bit of hand kneading to warm the dough if it has cooled) so the pasta rollers will 'pull in' the dough. Too thick and the rollers won't pull, too thin, and the sheet falls apart before the rollers can do their job. The pre-shaped dough is rolled out onto parchment paper strips - about 3 ft. long is a convenient length to work with. A strip of 1/8" plywood under the parchment paper makes handling the strips much easier. The greatest advantage of the pasta rollers is to make piparkūka thickness uniform - which helps standardize baking time. Kudos to Inga for sharing her love of Latvian cooking traditions! Thank you Ērik! Despite having a Kitchen-Aid roller, we still roll out by hand because my results always came out in pieces. I have decided to give it another try!